Today's post is not an usual post. You all know that I dont have my whole nail collection with me currently and that is why i have just black and white stamping polish and if you are stamping addict like me then you must agree that only black and white stamping polishes aren't enough. I thought why not franken some stamping polish with these two basic shades but my tattoo ink set is also packed with my nail stuff, so that wasn't an option either(see the tutorial for that here in Beaching Nail's tutorial). 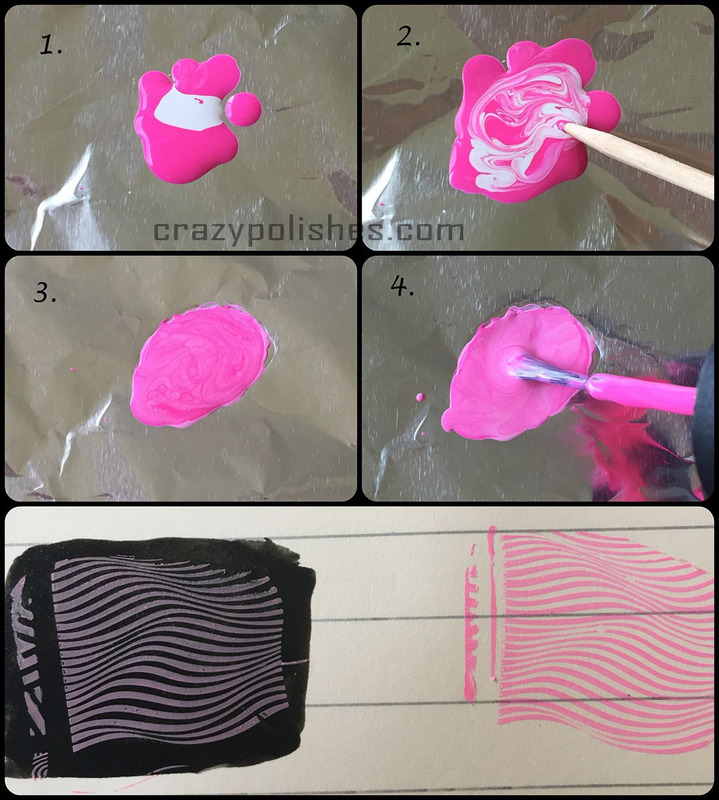 Continue reading to know how to make stamping polish. As I said that i had only two basic stamping polishes, so I started with white stamping polish. The mysterious ingredient to make colorful stamping polish is your regular nail polish. Yes i added few drops of regular polish to a drop of white stamping polish and mixed it well. The result not only stamp but it stamp beautifully on dark bases too, as you can see in the manicure above. You dont need any special polish or ink etc to make a new stamping polish. I am sharing the process for small quantity but you can make as much as you want. 2. Put one blob of white stamping polish and 3-4 blobs of regular polish. I put three here. If you are making in large amount. 3. Mix them nicely using a toothpick. 4. Your polish is ready.Check if you want to make lighter or darker. 5. I found the shade little lighter so i added one more blob to it. 6. Again mix it nicely or shake the bottle if you are making it in a polish bottle. 7. Now the polish is ready to stamp. 8. I used the same brush of regular polish to apply the stamping polish on the plate. Blue is looking lighter in the pics due to camera angle but it is very bright as seen in the manicure. 1. I used white stamping polish but it may work with a regular white polish which stamps too. however I didn't try but it should work. 2. 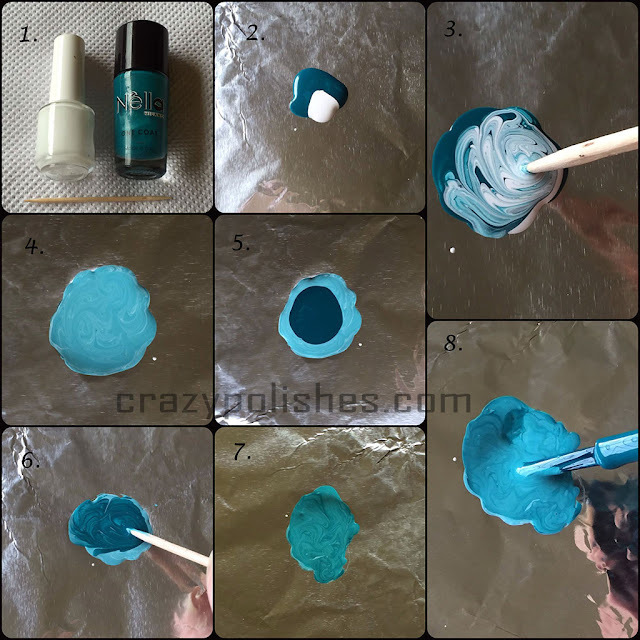 If you choose darker shade regular polishes than result will be normal bright stamping polishes (like blue and green in the manicure) and if you use light shade than you will get pastel shade stamping polishes. 3. One combination i didnt try but you can try easily is to mix black and white stamping polishes to make grey shade. 4. Dont make bigger difference in ration(1:4 or 1:5 is ok) otherwise you will and up in brighter shade but wont show up on the dark bases. 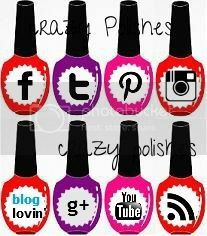 So, i hope this post help you to make some colorful stamping polish for yourself. No need to spend money on more stamping polishes(not on pastel ones at-least). OMG I can't wait to try this, thanks for sharing! Girl you are a genius! This is so obvious yet no one has thought of it. I bow down... awesome!